I recently returned from a visit to Kalangala on Bugula Island, the largest of the Ssese Islands in Lake Victoria, where I witnessed the negative social and environmental effects of oil palm production. The oil palm is a tree that produces a cluster of fruit that can be pressed to produce oil used for cooking. Some years ago the Ugandan government entered into an agreement with BIDCO oil refineries to develop oil palm plantations on the island as well as other locations in Uganda. After talking to individuals on the island, I have come to understand that the Ugandan government transferred large tracts it controlled to BIDCO as an economic development measure sweetening the deal by giving the company a fifteen year tax break. 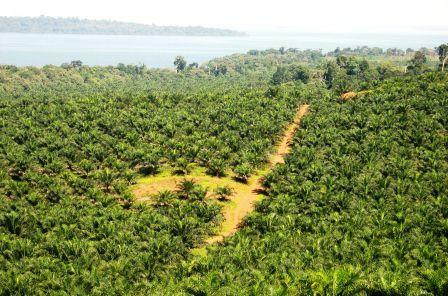 In Indonesia oil palm monoculture has been criticized by environmental groups because of the destruction of the native forests threatening the endangered orangutan. Something similar is happening in Kalangala with one third of the island now covered with oil palm plantations. Great tracks of native forests have been destroyed threatening the traditional way of life of islanders who used the forests for wood for cooking, housing and boat building. Charges of “land grabbing” have also been made as islanders have lost land that was used for generations. Moreover, the use of fertilizer and herbicides on the oil palm plantations results in runoff to neighboring land as well as into Lake Victoria. They earn 3000 shillings per day, about $1.20. They are expected to work every day with no time off. They work without protective clothing with only boots and paper dust masks. They live crowded together in company housing sleeping on the floor without mattresses, packed together like sardines. Because food provided by the company and sundries from the company store are deducted, their net pay is between zero and 40,000 shillings per month, the latter being $16.00 in US currency. 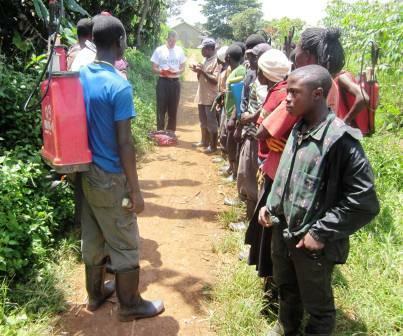 Interviewing oil palm workers who spray herbicides to control vegetation. THE GREAT RECESSION: WHAT NOW IS THE VALUE OF A COLLEGE EDUCATION? New data on how people with and without college degrees have fared in the Great Recession has just been published by Georgetown University's Center on Education and the Workforce. The news for those with a high school education or less is grim while those with advanced degrees or bachelors degrees have fared better. Let's look at the data and graphs - all from the Center's Report Weathering the Economic Storm. 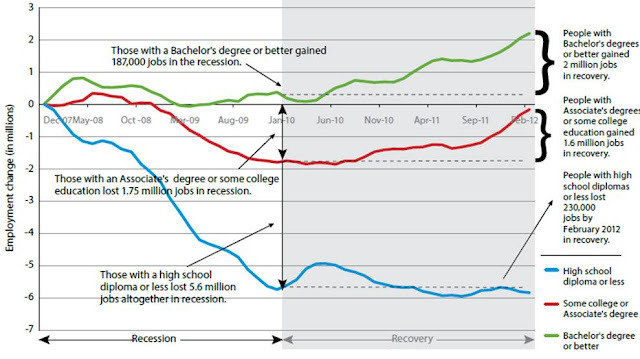 The first graph shows job loss during the recession and now during the slow recovery. Net job loss for people with bachelors degrees or better was small during the recession and the recovery has added some two million jobs in this category. 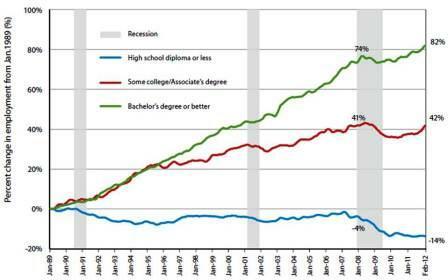 Associate degree or some college lost jobs during the recession but have gained all back in the last two years. However, high school or less jobs were reduced by 5.6 Million without any growth in the recovery. Next let's at change in employment over a longer period of time from Jan 1989 to February 2012. Job growth among the most educated is strong, that of those with some college comes next and those with a high school education or less show a net loss of jobs. 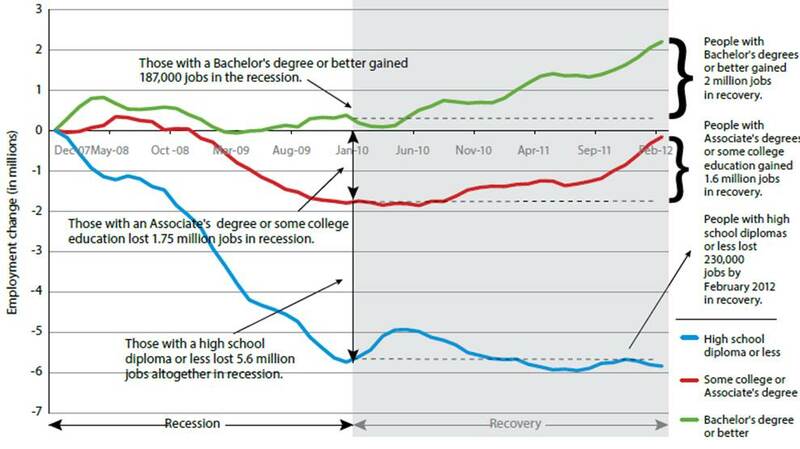 So the graphs show that the benefit of a college education continued during the Great Recession and difficult recovery that we are now in. So the reason for soaring college enrollment is clear - the opportunity for a good job in this time of high unemployment. 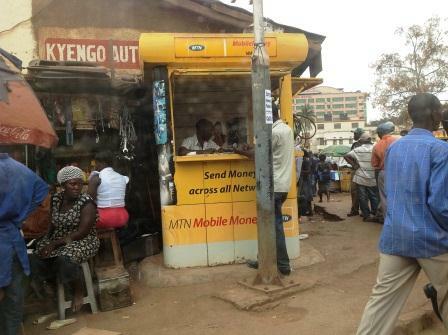 Cell phone usage is common here as one can tell on every Kampala street and country lane. This is confirmed by the recent survey by the Uganda National Bureau of Statistics mentioned in the post below and reported in the Daily Monitor. 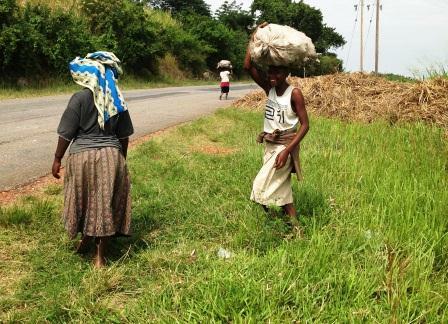 The survey found household cell phone usage at 87% for urban Ugandans and 53% of those living in rural areas. These numbers are eye-popping when contrasted with electricity use which is 53% among urban households, just 5% among rural ones. 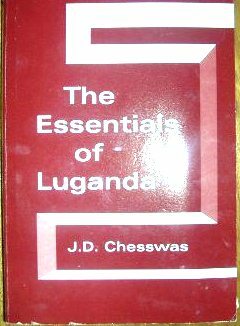 And note that the great majority of people in Uganda - 80% - live in the countryside. 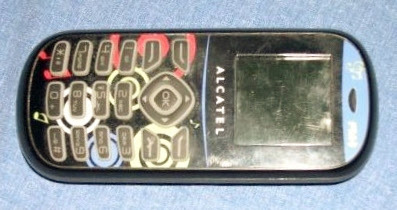 My cell phone that I use in Uganda purchased new for $30.00. It is not a smart phone but it handles texts and has an alarm. Very reliable and handy. "Send money across all (phone) networks" this booth says. In this developing country, cell phones have come to play an important role and not just for making calls. The country, I was surprised to learn, uses cell phones in novel ways. 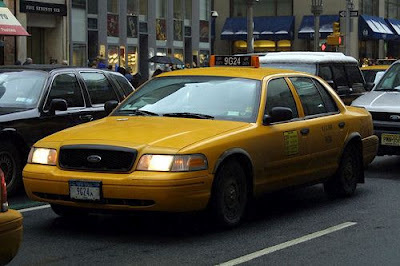 For example, individuals area able and frequently do send money via cell phones. Here is how it works. The cell phone companies have small offices virtually everywhere. 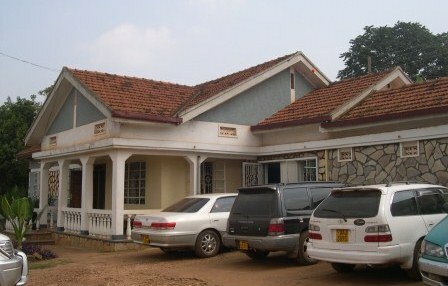 At one of these offices an individual deposits the money to be transferred along with a small fee. A message is sent to the cell phone of the person who is receiving the funds who then goes to her nearest cell phone office to collect the cash. Since Uganda operates as a cash economy without bank checks and credit cards, transferring money this way fills an important role. Moreover, cell phones are now being used a Ugandan to pay bills for electricity, phones and other services. So the cell phone companies are beginning to act like banks allowing individuals to transfer money and pay bills. Sign advertising "pay your electric bill" by phone. There is something else about the way cell phones work here that is quite different from the U.S. First, one buys a cell phone and then buys airtime. This is done primarily through cards that cost from 1000 Uganda Shillings (25 cents) to 10,000 Shillings ($2.50) or more. One loads this airtime by entering a coded numbers on the card into the phone. Because the cell phone companies have small entrepreneurs selling cards virtually everywhere, these cards are easy to find. Economic development happens in an organic and mostly unplanned way. In Uganda and other developing countries, the wired infra-structure for phones has been largely skipped as the country has moved rapidly to cell phones avoiding LAN lines. 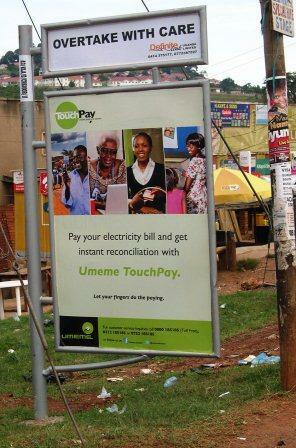 I was surprised how Uganda has adopted telecommunications technology. Their creativity is something to admire. 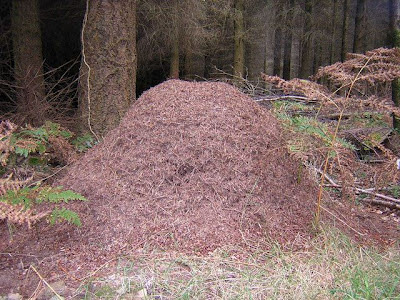 Ant Hill in Devon, Great Brittain. © Copyright Brian Henley and licensed for reuse under Creative Commons Licence. Dear Readers, astute person who sent me a response noted, the picture referred to in question 13 of the posting below of July 12, TEST YOUR KNOWLEDGE ABOUT UGANDA, is actually a termite hill, not an ant hill. 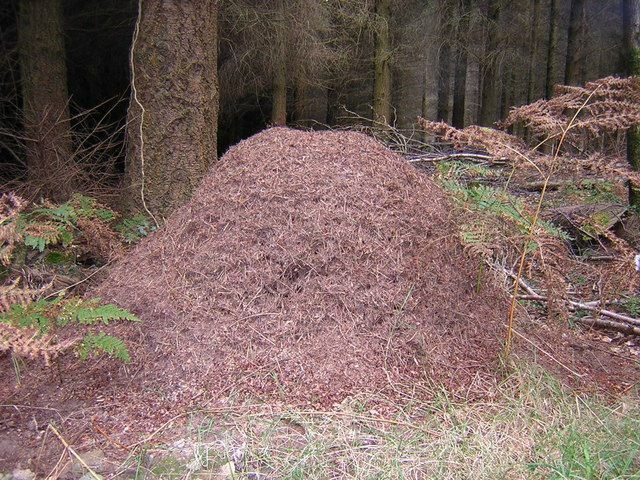 My apologies and for those of you who answered termite hill, please add one to your score. Mpanga Forest (A above) aerial view. Note loss of forest habitat (dark green) in surrounding area. 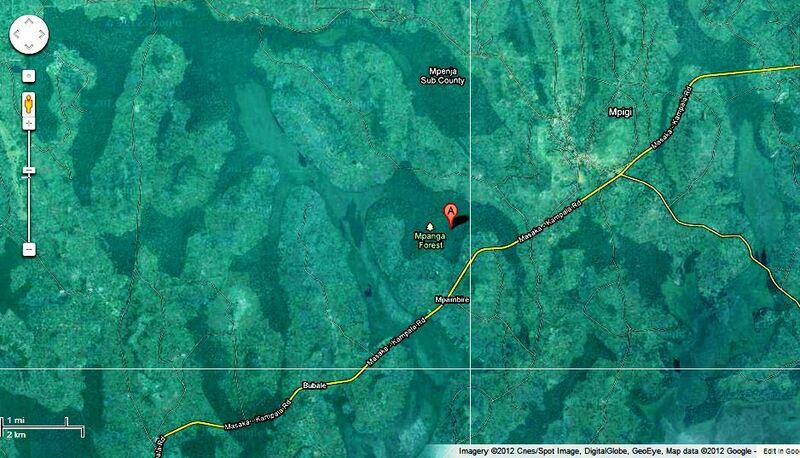 Mpanga Forest in Mpigi, about 45 KM (25 miles) southwest of Kampala, Uganda. Mpanga Forest is an approximately 450 hectare (1100 acre) preserve that hosts many species of butterflies, birds and monkeys. But most impressive are the trees, tall, stately, creating a rain forest canopy high above the ground. 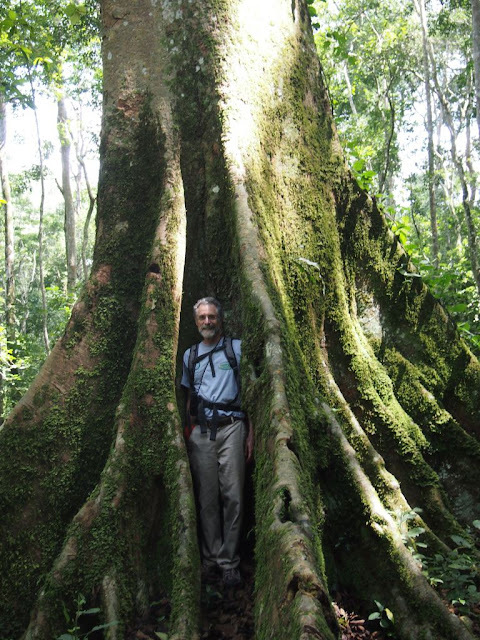 A large fig tree in Mpanga Forest with the Author for comparison.